We will discuss Teen Lyme on April 24, 2018 at 8PM EST. I will include a discussion with a 16-year-old boy with Lyme disease. Comments are no longer live. This is an archive of a Lyme Hangout held on 4/24/2018. You can still view the video below. For the next Lyme Hangout where you can participate, Save Your Seat by clicking here. Lyme disease was first identified in 1975 in a group of children and adolescents living in Lyme, Connecticut who suffered from recurrent attacks of asymmetric swelling and pain in the knee. The patients were initially diagnosed with juvenile rheumatoid arthritis. "The typical patient has had three recurrences, but 16 patients have had none," noted lead investigator Steere, then a postdoctoral fellow in rheumatology at Yale University.1 "During remission, some patients remembered short periods of joint pain, sometimes lasting only hours, without swelling (and therefore, not included as attacks)." Only a handful of studies on children and adolescents with tick-borne diseases have been done, despite the prevalence of the diseases in this age group and the potential for long-term health consequences. In a second case reported in 1998 by Fallon and colleagues, a 16-year-old boy, named David, was initially presumed to suffer from long-standing depression. He presented with anger, frustration, insomnia, poor appetite, mild weight loss, and passive suicidal ideation. His longstanding depression was "exacerbated recently when he stopped dating a girl after only two weeks because he felt too tired and not smart enough," according to the researchers. 5 "He reported feeling spaced out all the time, as if in a fog." David also lived in a Lyme endemic area. David’s steep decline in cognitive behavior and IQ were initially presumed to be caused by "either laziness or mild depression." His grades declined from A and A- in seventh grade to nearly failing by tenth grade. He appeared lazy because he found it hard to get out of bed in the morning. He often forgot to hand in assignments that he had in fact completed. He reported trouble staying awake in class and trouble concentrating. While the young man had "had embedded tick bites," wrote the researchers, "he could not recall ever having had an erythema migrans rash." David’s "Lyme ELISA was negative twice in the prior 3 months, his IgG Western blot revealed 4 of the 5 requisite CDC specific bands." The neuropsychologic evaluation, said the researchers, showed "significant deficits in processing speed and visual spatial memory." Researchers added, testing by a brain SPECT "revealed moderate to severe diffusely and heterogeneously decreased perfusion in the cortex and the central white matter, consistent with encephalitis, vasculitis, and Lyme disease." David was diagnosed and treated with excellent results for probable Lyme encephalopathy with 12 weeks of intravenous ceftriaxone. He improved on sleep, appetite, headaches, joint pains, numbness, distractibility, short-term memory, and emotional behavior. His depression cleared without the need for antidepressant medications. His IQ improved by 22 points, and his school performance markedly improved. Like the case of 7-year-old Susan, David’s case also illustrates the need for careful diagnosis and treatment of tick-borne infections in young people. So often these infections look like the common problems see in school-aged children: depression, ADHD, joint pains from growth spurts. These cases show the need to not only look at symptoms, but to be mindful of where students live and play. 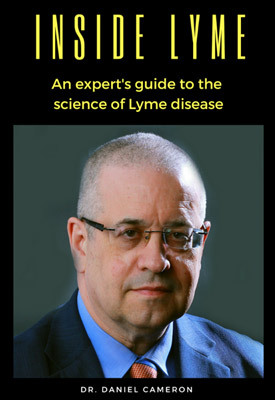 Text from Dr. Daniel Cameron's Book: Lyme Disease takes on Medicine. Bloom BJ, Wyckoff PM, Meissner HC, Steere AC. Neurocognitive abnormalities in children after classic manifestations of Lyme disease. Pediatr Infect Dis J. 1998;17(3):189-196. Vazquez M, Sparrow SS, Shapiro ED. Long-term neuropsychologic and health outcomes of children with facial nerve palsy attributable to Lyme disease. Pediatrics. 2003;112(2):e93-97. Fallon BA, Kochevar JM, Gaito A, Nields JA. The underdiagnosis of neuropsychiatric Lyme disease in children and adults. Psychiatr Clin North Am. 1998;21(3):693-703, viii.